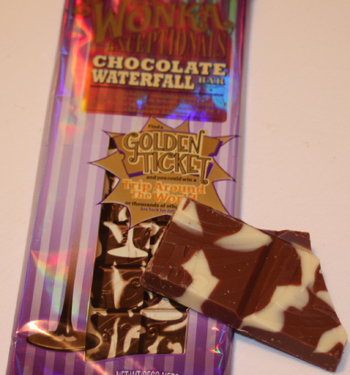 Home » Chocolate » Wonka’s Exceptionals: Chocolate Bars – disappointing, unless you’re an Oompa. I looked up “exceptional” in the dictionary and found that it means unusually excellent or superior, extremely rare and extraordinary. Then I looked through the Wonka website and they are promoting these Wonka Exceptional Chocolate bars as “the World’s Most Incomparably Imaginative Chocolate.” And they must be exceptional – they are made in a factory that is made of candy! The wall paper is lickable, there is a chocolate waterfall, and they GROW gummi bears. Awesome – I’m overly joyed. Can’t wait to review these things. 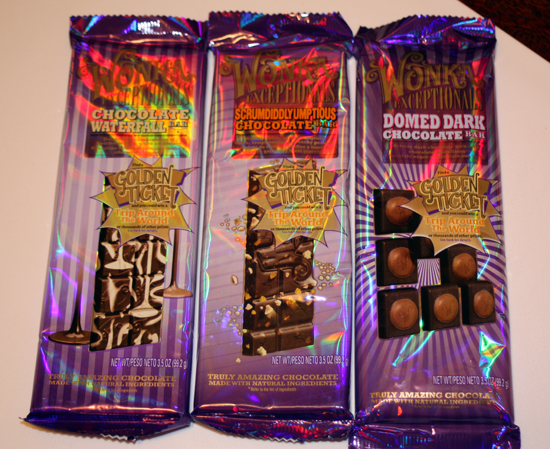 The packaging of the Wonka Exceptional Chocolate bars is wondrous and whimsical, and there’s a possibility of finding a Golden Ticket for a chance to win a trip around the world. The bars are numbered. In this case #3, #17, #99 like lithographs or something rare – or EXCEPTIONAL. Still…let’s be clear here: there is no Willy, there is no Slugworth. And Wonka is owned by Nestle, which is run by people in suits and not by Oompas in jumpers. So with definitions and Wonka knowledge in hand, I started snapping pictures of these three Exceptionals’ Chocolate bars. The first thing I notice is that the iridescent packaging makes it very difficult to read – possibly to hide the fact that High Fructose Corn Syrup is one of the ingredients. Mostly it’s confusing. I won’t go into the deluge of information on it but there is a bunch and all difficult to read. The second thing I notice is that the package is hermetically sealed – they will be here ready to eat after we are all gone. If the chocolate even comes close to the build up of the packaging this chocolate will be extraordinary. And the chocolate… isn’t. Not even close to extraordinary or exceptional. For all the fanfare and naming – not only is it not exceptional – it is not great, it is not good, and I don’t even think it is average. The Scrumdiddlyumptious Bar is by far the best of the three I tried. I really like the taste and chrunchiness of the embedded ingredients – a mixture of toffee, cookie and nuts – but the bar on the whole is only fair because the chocolate is just not tasty. Its not exactly the sweetness that turns me off, though it is too sweet; maybe its the creaminess, maybe a combination of the two, but its simply not something I want to eat. I would give the bits inside the bar an 8 rating and the chocolate a 3. Let’s call the whole thing a 6, which is by far the best of the bunch. The quick and dirty on the Domed Dark Chocolate and Chocolate Waterfall Bars: The Waterfall is a combo of Milk and White chocolate. The two flavors aren’t distinct and the bar is overly sweet. I would give it a 4. 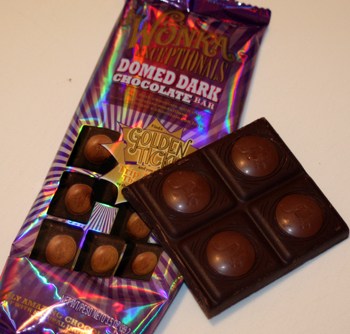 The Domed Dark Chocolate Bar I just don’t get. Why would anyone put milk chocolate with dark chocolate? People who like dark chocolate tend to not like milk chocolate and visa versa. Who is this for? Not me. But the biggest issue for me is that the dark chocolate is really horrible. Its creamy, which I don’t like in dark chocolate, overly sweet and doesn’t even taste of cocoa. This bar is the weakest and I give it a 2. I’m sitting here looking at a whole Domed Dark Chocolate bar minus one single square. This is chocolate. For me – that’s unheard of. I’ll eat a plain Hershey bar any day before I go back to this one. Hey Wonka: you advertise that your Exceptional line is “The World’s Most Incomparably Imaginative Chocolate,” and on some marketing levels it might be but in the end, it’s all about the chocolate and unfortunately, the chocolate does not taste good. Also, if you are calling these “Exceptional” and charging $2.39, I’m thinking that you are marketing these to adults. And if so, you should know that this adult at least has no need for the overly fancy packaging and I certainly don’t need cookies, toffee and nuts in my bars. I also don’t need chocolate that looks like a waterfall. And I definitely don’t need little buttons of milk chocolate sitting atop my dark chocolate. I simply need my chocolate to taste yummy. And that’s all. All in all these chocolate bars were very disappointing, weak and confusing. Overly hyped, probably too expensive and just not tasty enough for you to go out of your way for. My hopes were that Wonka would put their highest paid, most experienced Oompa on this line but I think they used one of the little dudes who rolled out Violet. The Oompa’s might be getting a bad rap here. They really are adorable. Oompa Loompa is more formal. I have a personal relationship – thus Oompa. Those cute, little, orange bastards – gotta love em. Disappointing to hear. Everything else I’ve read has said that they are decent chocolates and quite a step up from the old wonka bars. At least they’re still making tasty fruity stuff. I do not have the same opinion. I don’t care what the ingredients are, these Wonka Bars taste so good. The first time I had one was for a fund raiser for a school. Good cause, good chocolate bars! 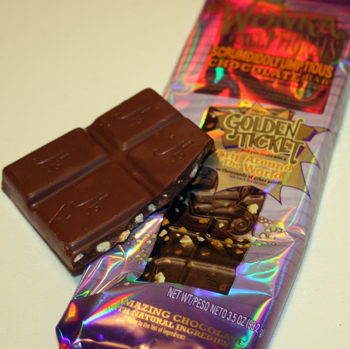 BRING BACK THE SCRUMPWILLY CHOCOLATE BARS BACK PLEASE I WANT THESE DAMN THINGS BACKKKKKKKJK AHHGHGHGGHHGHGHGH!!!!! I want Chocolate Waterfall Milk & White.